The idea of yet another found footage movie doesn't interest me in concept but I saw one of these movies last year that really impressed me (do yourself a favour and see Afflicted already (review)) so I'm willing to give a couple of these a go just in case one might deliver something good and Ghoul may well be the first candidate of 2015. They are plagued with a series of unexplainable supernatural encounters and come face to face with the evil spirit of Andrei Chikatilo, who was born in the Soviet Union and was the most violent serial killer and cannibal of all time. I was totally on board leading up to the supernatural angle and though that irks me a little, I must admit I'm curious to see how this turns out. Admittedly part of the appeal is the unique setting but I'm hopeful the movie delivers on the promise of the trailer: great on camera effects. 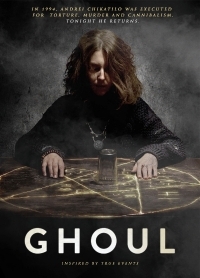 Ghoul opens in limited release March 20.